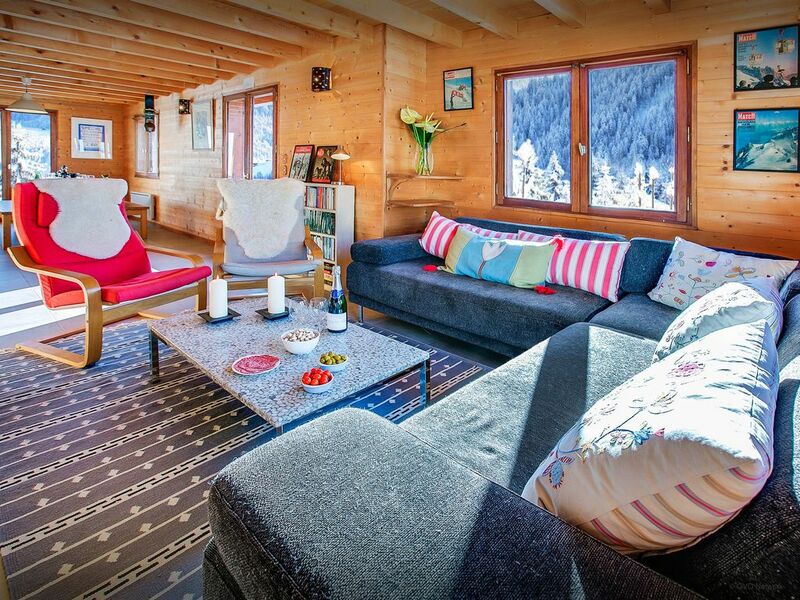 Just a few minutes away from the charming village of Manigod, Chalet Les Houlottes is the perfect base for two families or a group of friends looking to enjoy all the La Clusaz region has to offer. Combining comfort, practicality and style, Les Houlottes' south-facing position makes the most of panoramic views of La Tournette, Val Sulens and L'Aiguille, and the newly-built terrace is the perfect place to admire them. The chalet is in a quiet position, but it's just a 15-minute walk in to Manigod village, where you can pick up fresh bread and regional delicatessen, enjoy a Savoyard meal in Val Sulens restaurant, which will also do takeaway food. Set over three floors, the stylish accommodation at Les Houlottes offers plenty of space for nine people. Two comfortable living areas mean there’s room for the adults to enjoy a quiet evening around the fire while teenagers let off steam in the huge games room, playing table tennis, darts, Xbox or watching TV. There are two double bedrooms, one triple and a twin, where the beds can be joined together, and two bathrooms. Two of the bedrooms open on to the sunny balcony - the perfect place for your morning tea. The kitchen has everything you need to cater for a large group, and the dining room has double doors out on to the terrace, so you can eat outside on a clear night and watch for shooting stars. With the ski bus stopping in the centre of Manigod, you’ve got the whole of the Aravis ski area at your disposal - more than 200km of slopes. If you choose to drive, there’s plenty of parking at the ski stations. Floodlights on some of the pistes mean you can ski until 1am in La Clusaz, on certain dates throughout the year, and the weekly torchlit descent is an experience you’ll never forget. Cross-country skiers will find plenty of trails to choose from, and non-skiers are not forgotten, with a heated indoor/outdoor swimming pool, ice rink and cinema, as well as sledging, snow-shoe walking, dog-sledding and horse-drawn sleigh rides. In the summer, you'll be hard pressed to tear yourself away from the stunning views and the sunny terrace at Les Houlottes, but if you don’t, you’ll miss out on all the fun and adventure of summer in the La Clusaz region. There’s no shortage of walks, from mountain trails to hiking on the Gliéres plateau, the scene of the Resistance’s campaign in World War II. Adrenalin junkies can try paragliding, canyoning, climbing, mountain-biking or white-water rafting - just some of the activities on offer within a few miles of Manigod. Via ferrata is a great family day out, with children as young as eight able to explore the mountains on iron walkways, safely secured to a harness. Please note the drive is quite short and steep. Even when cleared of snow you may prefer to park your car at the bottom of the drive and walk up (approx. 20m). Although the property accepts 3 babies on top of the total capacity, please note that there is only 1 baby cot and 1 high chair available. The children's rooms are lovely ! Also the TV room is great. The chalet was warm and comfortable with plenty of hot water, ideal after skiing. The snow was great and we loved the restaurant of Marie-Ange Veyrat. Well equipped, charming property with stunning outlook. It's a lovely and quiet location but within good reach of surrounding villages. There was plenty of accommodation for our party of 6 adults and the table tennis was a bonus and in constant use. The weather was superb and the scenery spectacular. We had a wonderful stay in this great chalet. It is a spacious, comfortable and well equipped house with everything you need. The service was uncomplicated and we felt like home. Everthing perfect. There are also great possibilities for hiking, climbing, cycling, with beautiful lakes nearby. Thanks a lot. Skiing great, chalet great, everyone happy! We had a really super holiday at Les Houlottes. You can tell it is a loved chalet. After a long day skiing, to sit by the fire with a book was a dream! I'd like to have stayed until I had finished reading all the books. I like how the telly is in the playroom and not in the sitting room. The beds were comfy and we slept very well as it was so quiet at night. I would love to see it in the spring. Also we liked to be able to bring our dogs. Thank you. Great walks, great views, great food, great cycling. Fantastic spaces, comfy beds, games room was great too! C'est parfait! Bonjour Jean-Paul, merci de votre commentaire. L'équipe OVO Network est désolée de votre déception, mais l'annonce comme le site internet de la propriété indique bien que le chalet est à 8km des pistes (domaine skiable de Croix Fry / Merdassier) et non de La Clusaz qui en effet se trouve plus loin. Nous prenons soin de bien informer les vacanciers de tous les points positifs et négatifs de chacune des propriétés OVO Network afin qu'il n'y ait aucune déception à l'arrivée. Le but étant que les vacanciers réservent encore et encore sur le portail OVO Network !